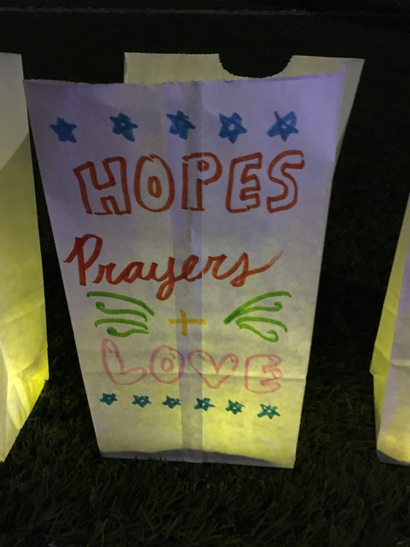 Over 300 middle school students participated in the 4th Annual “Menlo Park Relay for Life – Hillview Edition” on Friday night, raising $91,000 to fight cancer and topping the $65,000 raised last year. The students held bake sales around town for the last month and reached out to their neighbors, family members, and friends for donations. All funds raised go to the American Cancer Society to support research to find a cure for cancer and provide services — everything from wigs to wheelchairs — for people battling cancer. “At some point during the night, it will hit you. You’ll think ‘what we’re doing here is something truly incredible. '” Devin Leslie, Hillview 8th grader, told the students in one of the preparation meetings leading up to the event. Countless strings of purple and green lights transformed the Hillview track into a celebration of service. A DJ kept the energy up with contemporary tunes, while baked treats, pizza, and a photo booth contributed to the celebratory atmosphere. As the sky turned dark, kids used neon glowsticks as necklaces and headbands to help light up the night. “It was amazing to see over three hundred people coming together to fight against cancer. The energy on the field was contagious!” Claire Auslander, Hillview 8th grader. At another station, students traced their hands and pledged to make healthy choices to prevent cancer. Kids learned facts about cancer while refilling water bottles at a third station, and a fourth station handed out strings and a bead for every lap completed to encourage and reward their efforts. The Hillview orchestra (above) played a few songs during the opening ceremony with glow sticks attached to their instruments. Friend of the community Meg Hornaert, a cancer survivor, addressed the kids before the event to impress upon them their role as change makers, and to thank them for all their efforts. 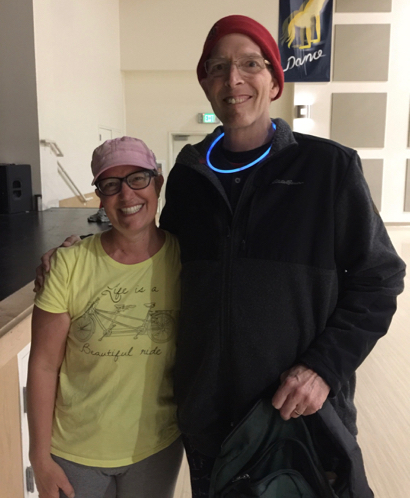 Longtime Menlo Atherton High School biology teacher and cancer patient Rick Longyear was also on hand to inspire the kids and thank them for their contributions. (Meg Hornaert and Rick Longyear in photo below). By the end of the night most of the students had walked for miles, with a few kids lapping the track more than 40 times. “Seeing students and staff coming together to fundraise on behalf of the American Cancer Society is such a rewarding experience. Each year, my heart is filled with joy at the generosity of our local community,” said Batiste. You can click here if you would like to make a donation to add to Hillview’s funds raised for the American Cancer Society. 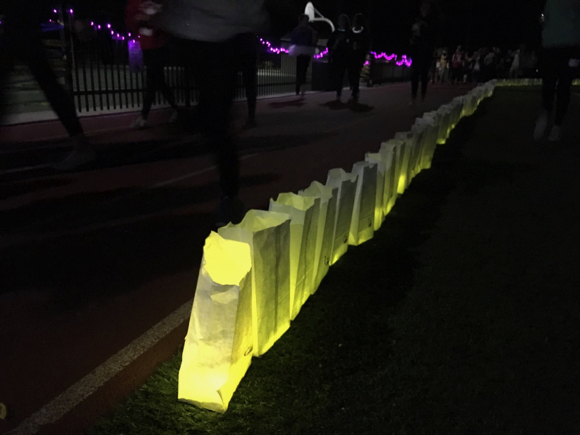 Or, building on Hillview’s efforts, the upcoming Menlo Park City Relay for Life, organized by Menlo Park resident Amy Boggs, is scheduled for August 11 – 12 at Burgess Park. There is still plenty of time to start or join a team! Relay for Life was started in 1985 by Dr. Gordon “Gordy” Klatt’s, in Tacoma, Washington, and now takes place in 27 countries.